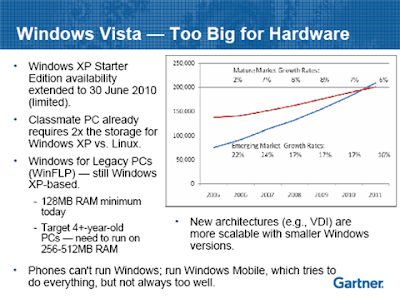 An interesting report just issued by Gartner Research lays out the argument that Windows has become too bloated and is not what the market wants. As a result, the operating system is collapsing in the eyes of the tech industry. Windows is not evolving along the lines that the rest of the industry is, particularly in the areas of modularity and virtualization. Although Microsoft has made efforts in both areas, they are laughable at best. Has the rest of the world finally come to terms with what many tech heads have been screaming for years now? Will Microsoft be able to change the direction of their oversized barge of an OS? The next years will tell all, but I fear that unless Ballmer is replaced with someone younger, more in touch with the tech generation and with a better defined vision of the future of tech, Microsoft will go the way of so many companies who refused to innovate and adapt.